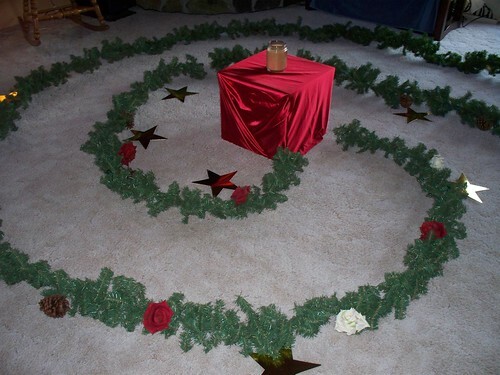 In our living room, I set up an "Advent spiral" with greenery that winds around to a center point where there is a large, lighted candle on a stand. 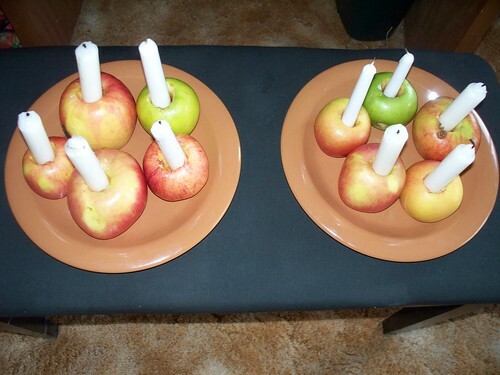 The children and their parents "walk the spiral", one by one, carrying their apple candles. When they reach the central candle, they light their candle, then turn around and walk back the way they came, finding a golden star that has been placed along the path to set their lit candle on. All this goes on while we hum "Silent Night". Here's what the spiral looked like before anyone arrived. 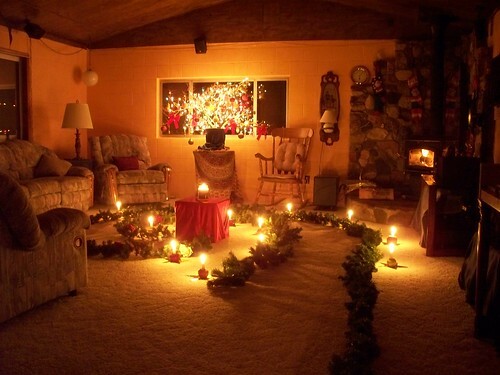 Then we all gathered in the living room to begin our advent spiral walk. There was a hush as we each waited our turn, humming, and each child was carefully watched, and in some cases guided, when lighting and placing their candles on the floor. When all the candles were lit and set along the spiral path, we sat quietly around the gorgeous scene, just drinking it all in. The idea was to symbolize lighting the way for the Christ Child. Then we sang "Gloria!" and I announced: "A light shines in the darkness. The Christmas Child is on His way!" Then everyone gradually, reluctantly, and peacefully got up and left. Very sweet! Here is a picture of the beautiful scene we enjoyed just after they all had filed out. I didn't want to blow the candles out!! 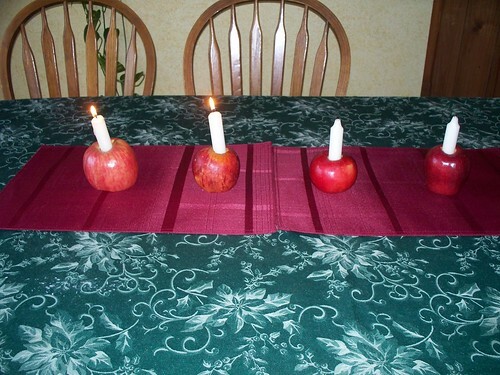 Someone asked me why I only had 4 advent candles instead of the traditional 5. 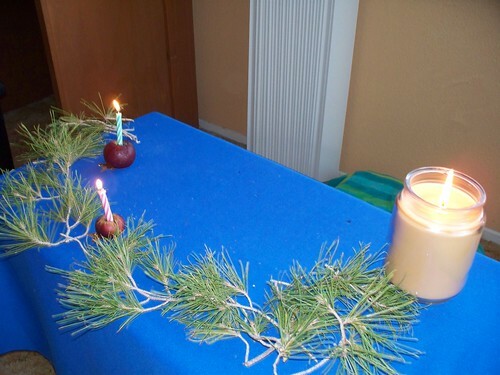 I always thought that the fifth candle would be better brought out and lit on Christmas morning when Jesus was born. That made more sense to me. But, I'm a non-conformist, and I like to make up my own rules.